The gopher tortoise (Gopherus polyphemus), unlike many other varieties of tortoises, is an avid digger. These sizable reptiles are known as "gopher" tortoises thanks to their burrowing habits. Gopher tortoises are found in the United States' southeastern region, including Mississippi, Florida, Alabama, South Carolina, Louisiana and Georgia. When gopher tortoises are fully mature, they usually are between 9 and 15 inches in length, according to the Savannah River Ecology Laboratory. Their top shells are usually either beige or brown in coloring. Their plastrons, however, are a somewhat lackluster yellow. Females have short tails in comparison to the males. 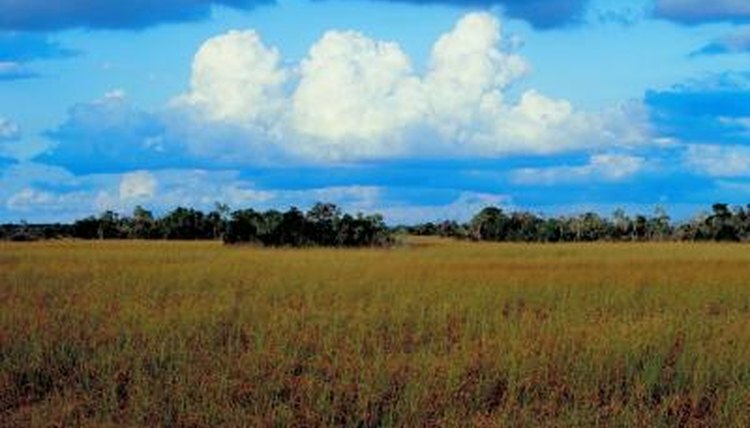 As far as living environment goes, gopher tortoises generally inhabit pastures, sandhills, fields, forests, sand dunes and sides of roads with ample grass. Gopher tortoises do well in sandy environments that enable burrowing. Gopher tortoises, for the most part, are herbivorous animals. Some typical elements of the gopher tortoise diet are berries, fruit, spurge, pines, herbs, beech, peas, daisies, asters and grass. Low plants are a particular favorite for gopher tortoises, especially those that appear under strong sun. One of their preferred grasses is wire grass. Although gopher tortoises strongly gravitate toward plants for their sustenance, they occasionally consume other things. They are sometimes opportunistic in their approach to food, and will even feed on the rotting remains of animal corpses. Gopher tortoises also feed on the stool matter of other creatures. Gopher tortoises that live in captive settings -- think zoos -- eat a lot of fresh fruits and vegetables. Some examples of produce items that captive gopher tortoises consume are bananas, watermelon, apples, alfalfa, cantaloupe, sliced up carrots, broccoli, zucchini, green beans, endives, sweet potatoes, white potatoes and escarole. They also regularly eat tortoise chow. Gopher tortoises don't typically eat animal flesh, although they once in a while feed on carrion. Since they are so big, they usually can avoid predation, as well. Wee hatchlings, however, are easy targets for some mammalian predators, including skunks, armadillos, foxes and raccoons. Snakes, birds and alligators are also all predators of gopher tortoise youngsters. What Do Lizards Eat in the Wild? Which Tortoises Grow the Fastest?